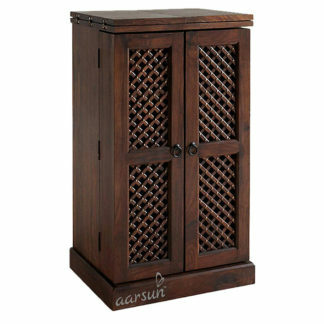 Aarsun Woods provide a wide range of premium quality traditional wooden Bar Cabinet. 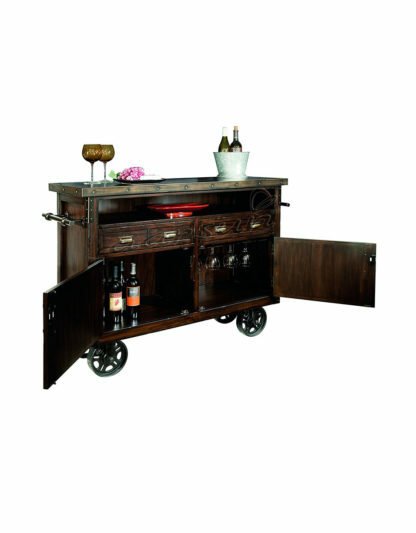 Most of all modern or contemporary design of wooden bar Cabinet has different style and different color. 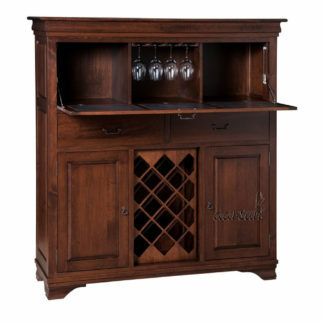 The Wooden Bar Cabinet is made from natural wood in warm, dark tones crafted with great skill. The design looks very simple in teak wood. 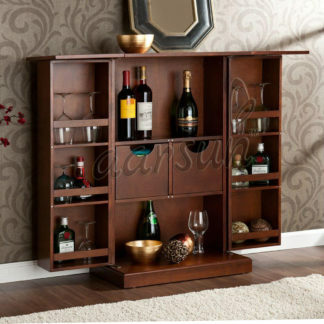 The Wooden Bar Cabinet has many compartments and shelves. The wooden bar cart have wheels that allow the cart to be easily moved around with the push pull handles. Hanging rack in lower compartment holds up to 8 glasses. Two full extension drawers with metal drawer include removable wine bottle holder and trays for versatile storage of up to 12 wine bottles. The top of the wine Cabinet can be used as a serving area. You can place bottles in the front of racks, or keep a small collection with wine glass and other relevant things in style. The mostly famous for being used in making furniture. It is the most useful timber source in India. The Sheesham wood is described as golden brown to deep brown in colour, with darker streaks that give the wood an attractive appearance. The wood is hard with a uniform and medium coarse texture. It has a good natural resistance to decay and is considered to be a popular carving and engraving wood in India. Sheesham lends itself perfectly to the cabinet making industry as it seasons well and does not warp or split. It is extremely durable and is one of the timbers least susceptible to dry-wood termites. Each piece of Sheesham furniture will have a unique colouring, thanks to the well defined grain of the wood, which can be brought to a fine finish by hand waxing. Sheesham furniture often features hand forged wrought iron work, known as Jali ironwork. As well as high quality furniture, Sheesham is also used for marine and aircraft grade plywood, charcoal for heating and cooking, musical instruments, ornamental turnery, carving, engraving, tool handles and sporting goods. Sheesham makes the perfect space for Antique Furniture. The wood takes a good polish and finishes to a smooth lustre. There are a number of designs available in Wooden Bar Cabinet we suggest you to have a look at Aarsun Woods Stylish Bar Cabinet.